We try to train them both: I dare say some of us have had more success training our roses. Or is that just my sweetheart’s elderly rescue dog, who would rather slowly blink one eye, then the other, pretending he hasn’t noticed the dog treat I’ve balanced on his long, Boykin spaniel nose in a last-ditch attempt at enticement, than do what I’m asking? Over the time we’ve been domesticating them, we’ve physically changed the nature of roses and dogs to better suit our needs and desires. By first selecting, then actively breeding from the most attractive or useful, the companions we have today in our homes and gardens are far removed from nature’s prototypes: wolves and wild roses. We’ve pushed and pulled nature every which way, until just as we have many different of breeds of dogs, we also have rose hybrids of almost every size, habit, form, fragrance, character and colour we can imagine. Today’s hybrids can have a hundred petals or more – a far cry from the five petals of wild roses. We even have striped, splashed, speckled and picotee roses – I’d love to see a picotee dog! Just as the faces of dogs – and many of their mannerisms – seem designed purely to melt the hearts of ‘their’ humans, today’s roses are also engineered to be pretty much irresistible for those who are in any way susceptible to their charms. 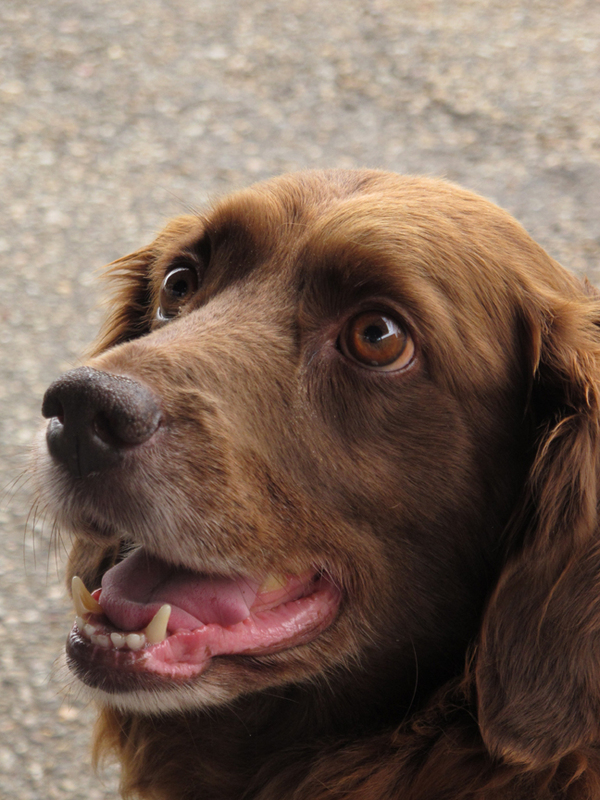 We’ve selected dogs for their loving, companionable natures; their ability to herd or hunt other creatures; their ability to sniff things out; to retrieve things for us; to bark and raise the alarm; even to guide or rescue us. And at much the same time, we’ve been breeding roses for pretty much any purpose you can imagine a plant serving. Today’s gardeners can choose between varieties that will decorate their arbours or walls, ramble over their trees and buildings, create prickly hedges, grow in containers, be used as bedding or for landscaping, or grow in mixed borders. Organic gardeners can choose varieties that do fine without any spraying at all. OK, I hear you, they don’t float on water and I know we haven’t got a true blue one – yet! It’s been helpful that roses – like dogs – reproduce quite quickly. Breeding tree peonies takes much longer: a lifetime is barely enough for a breeder to coax eight or ten successive generations of seedlings to flowering stage. Now that’s dedication! In contrast, young rose seedlings will produce their first flower just few weeks after germinating, although it takes years of testing to be sure of their garden-worthiness. We’ve lived beside our roses and our dogs for so many years that our lives have become intertwined. Perhaps that’s why many varieties of roses do seem more dependent on us and to need a little more care than other flowering plants. 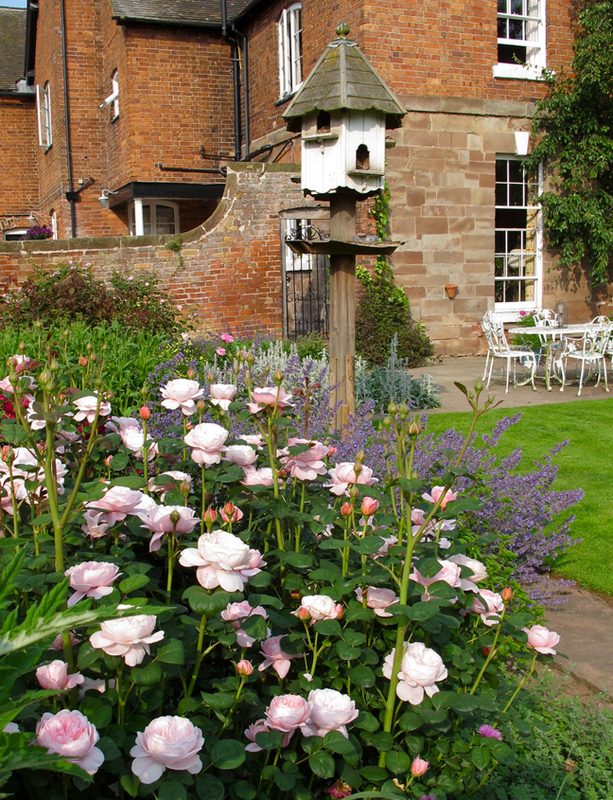 But as we’ve stepped up to the mark, tending, training and trimming them, the roses have gratefully, amply returned our care: not just with an abundance of beauty, but also their ability to soothe and even heal us with their highly prized essential oil. Experts will tell you that we have so many different styles of roses these days that it’s well worth taking a little time to understand their habits before making your choice if you’re planning to welcome one into your own garden. If you approach buying a rose pretty much the same way as buying a dog for the family, by taking account of the characteristics that have been bred into it, you won’t go too far wrong. Basset hounds make a pretty poor choice to guard your home – they have such phlegmatic natures that they might not even stir to greet a visitor. And you wouldn’t buy a sheep dog or a whippet unless you had a place in mind where it could run. Few people will hesitate between a Chihuahua or a St Bernard: you’ll be very aware that size matters. In the same way, don’t buy a huge rambler such as ‘Kiftsgate’ or ‘Wedding Day’ to grow up a small garden obelisk – that’s asking for trouble. You’ll soon have more scratches on your arms than flowers: you’ll have to prune all the flowering stems off it just to keep it in check. And I’d suggest that you opt for a shrub rose rather than a hybrid tea if you want it to mingle naturally in with other shrubs and perennials in a cottage garden. And never buy a rose just for the name, no matter how tempting that might be. 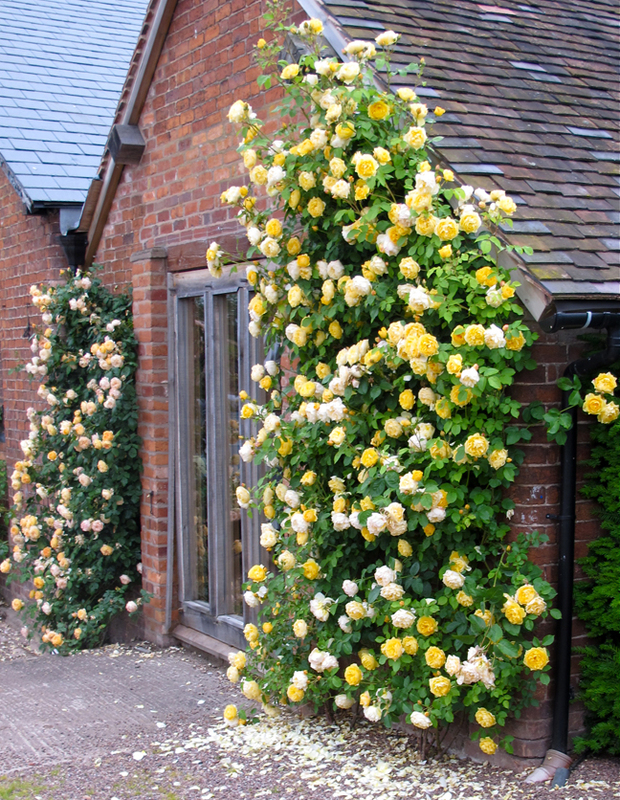 Though there are exceptions, be aware that if you make a strong and haunting rose fragrance your overriding priority, you may end up making some other compromise – perhaps you’ll not get quite such a productive or disease-resistant plant. And, without a doubt, you’ll not have as many varieties to choose from. But when you’re enjoying the scent of your roses, I doubt that’ll bother you! With so many types of dogs and roses, each with their own natures and needs, we perhaps need all the help we can get when we’re about to make a commitment. I’ve not spent too much time on dog forums, but feel sure they’ll be very similar to the rose forums that are overflowing with passionate, community-spirited gardeners, dedicated to these alluring plants. They share stories about the virtues – and quirks – of tried and trusted rose companions, enthuse over pictures of the latest varieties and lament the ones their climate and growing conditions failed to support. They give each other encouragement and advice on how to care for their plant pets and share pictures that inspire and instruct. But it’s not always about co-operation: people have long compared roses and dogs competitively, hoping for theirs to be judged the best at prestigious annual shows, with complex rules and regulations. The first UK Grand National Rose Show was held in 1858. According to Wikipedia, it quickly became clear that London’s venues were too small – 16,000 people attended the third show when it moved to the Crystal Palace in Sydenham. In contrast, the British Kennel Club’s annual Crufts dog show merely dates back to 1891. Recent winners of Cruft’s coveted Best In Show award include Afterglow Maverick Sabre and Soletrader Peek A Boo – names that wouldn’t seem too out of place on some styles of rose (more on rose naming another day!). All considered, it’s not surprising that I’ve come to think of roses as the faithful, dog-like companions of the plant world. Whether we show, breed or simply enjoy Man’s Best Friends – of the animal or plant variety – it’s hard to imagine life without them.